by ZW Spanish Gunfire and out of Kays Easy Luck. Produced a beautiful foal by ZW Spanish Gunfire who sold at 4 months old and placed second at the GSPA SSA futurty behind his half brother. 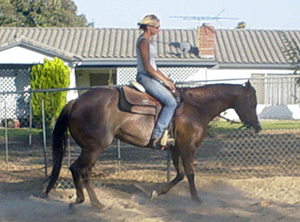 Mare is bred back to Impressive Equi Te for 2006 foal. 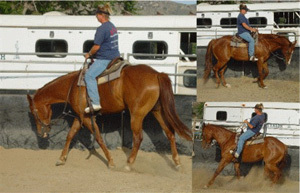 Super all around gelding. Going very well under saddle, and has NO refusal in him what so ever. Will be suitable for just about any discipline. This horse has the mind we all want on our horse. Just as easy as can be, I just cant say enough about this horse. He goes down the trail, likes cattle will go english or western!!!!!!! An all around good soul. 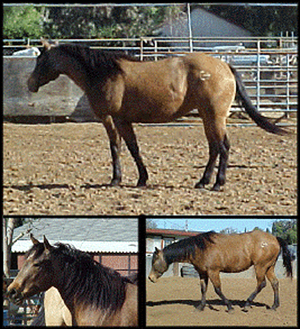 1999 Buckskin QH mare Sire: Badger Blue Missile Dam: Gold Kaweahan Being offered as a brood mareS ells with breeding to ZW Spanish Gunfire for 2006. Produced beautiful Bay filly this year that sold at 10 days old. 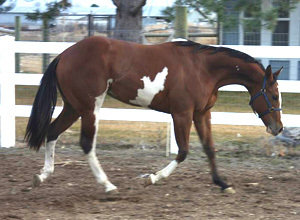 Her previous foal sold at 30 days old. She is an excellent mother, and a easy breeder. Total pleasure to have.